New marine field station aims to support sustainable aquaculture and preserve coastal ecosystems. If the shellfish of Baynes Sound could talk, what a story they’d tell. The millions of mussels, clams, oysters, barnacles, crabs and more that make their home in this 40×2 km strip of water between Vancouver Island and Denman Island could tell us stories both profound and dramatic, about the earth and the ocean, about tides and time, about sea creatures and shore creatures. The story might begin 400 million years ago, with the birth of what is now known as Vancouver Island. Vancouver Island was not originally part of North America, or even of Pangea, the ubercontinent that eventually split to form the current world’s seven continents. Rather, it emerged from the earth’s mantle in the South Pacific Sea, and from there it slowly — very slowly — migrated across the ocean to its current spot, hugging the Western shore of BC’s mainland. Here it functions as a gigantic, and gorgeous, breakwater, creating the sheltered environment which has enabled shellfish, and so much else, to flourish. The resulting clean water is essential to the whole ecosystem. Because the shellfish eat the algae, the water is clean enough for sunlight to filter down to the ocean floor. Because of the sunlight, seagrass can grow on the stable reef created by shells, forming a marine meadow. This provides shelter for a myriad of tiny ocean creatures, which in turn feed bigger ocean creatures, and so on up the food chain, including fish such as salmon and herring, birds such as heron and eagles, sea mammals such as porpoises and otters, and ultimately terrestrial species such as bears and humans. Without the living filters and reef-makers—the shellfish—this interdependent community of flora and fauna would break down. We humans are just one of the many creatures that have depended on the shellfish of Baynes Sound over the millennia, but in our typical way, we’ve had a particularly big impact on their lives and their home. Shellfish harvesting in Baynes Sound goes back some 5,000 years. Middens made of discarded shells, and heaped up rock berms from ancient clam farms, tell us that the region’s First Nations relied extensively on this super-healthy, readily available protein. These days, shellfish harvesting in Baynes Sound is a mainstay of the local economy, a $22-million-a-year industry that accounts for 52 per cent of BC’s total shellfish industry. The mussels and oysters of Baynes Sound may not have noticed the existence of this impressive structure, with its unique clamshell-inspired design and ambitions to be one of the greenest buildings in Canada. However, the work done here, if all goes according to plan, will have a positive impact on their future. 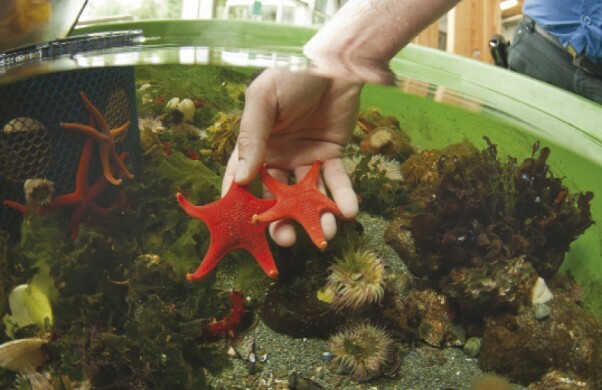 VIU’s Centre for Shellfish Research, in Nanaimo, has been around since 2001. The Field Station concept, borrowed from land-based agriculture, is a form of applied academics—it takes the research literally out into the field (or in this case, the ocean) and fosters close collaboration with industry, government, and the public. “We are taking the university out into the community,” explains Kingzett enthusiastically. He has no doubt there is a pressing need for this. “All of these coastal communities are absolutely connected to the sea, and there is no one in the area doing public education related to the marine environment,” he says. The Field Station has a bunch of plans to rectify this. The building will function as a marine science museum: there will be a 30-foot long aquarium, a jellyfish tank, rotating displays, touch tanks, and the skeleton of a 35-foot-long grey whale hanging overhead. The research labs have windows so the public can peer in and see what a marine biologist actually does. As well, there is a state-of-the-art commercial kitchen for culinary events, workshops, and courses. Students from VIU’s culinary program are already using this space. The Field Station is currently hosting its first summer day camp for kids, and will be offering educational programs for Kindergarten to Grade 12. As well, it is available for rental, whether for conventions, weddings, or anyone wanting a big room with an amazing view and a great kitchen. There are long term plans to build accommodation, but for now Kingzett is happy to provide business for local B&Bs and resorts. While putting all this in place to engage and educate the public, the Field Station is also keeping a keen focus on its other goal—improving and supporting the shellfish industry. Commercial aquaculture has been around in Baynes Sound since the 1930s and provides approximately 500 jobs in the area. It’s a keystone of the local economy, but it also garners its fair share of controversy. Environmentalists give aquaculture mixed reviews. On the one hand, the presence of shellfish demands, and contributes to, clean water. On the other hand, as the industry gets more mechanized, there are impacts such as trucks, cranes, winches and other machines on the beaches; increased boat traffic; and physical modification of the shore such as rock walls and channeling of streams. There are concerns about the effect of anti-predator netting on other intertidal species and about the leaching of toxins from plastics used in shellfish farming. As well, residents in shellfish farming areas sometimes report their peace is disturbed by intrusive noise, visual, and light pollution; their shores are littered with washed up debris; that swimmers and boaters are endangered by floating netting, submerged rebar, etc; and that the natural beauty of the foreshore is destroyed by rafts, equipment, netting, and traffic. Kingzett is well aware of all this—and he has plans to improve the situation. One of the Field Station’s first projects involved working with engineers to design an aquaculture raft that won’t break up in storms. In a similar vein, the Field Station is developing a shellfish nursery that uses solar panels, which will take generators off the ocean. The Field Station also has a conservation-driven research project aimed at re-establishing the Olympia Oyster, the only oyster native to the Pacific Coast of North America. The tiny “Oly” once carpeted the shore from California to Alaska, but almost disappeared due to over-harvesting and pollution. The research project will hopefully act as reparation for past human mismanagement. All farming has impacts, Kingzett points out, but we still need to eat. Ideally, we should be doing more of that from local sources. “Vancouver Island imports 90 per cent of its food. There’s a huge environmental impact to that that is transferred somewhere else, so we don’t see it,” he says. The shellfish industry brings us face to face with its consequences, but because it’s local, it offers a far more sustainable choice than eating foods from far away. “Talking about local food is part of living responsibly on the coast,” Kingzett adds. The aquaculture industry has plenty of common ground with citizens concerned about the quality of their community and environment, he points out. “It’s projected that this area will see 20,000 more people in the next couple of decades. That’s going to have a huge impact. We need to find a way for the shellfish industry to still be here, and for that to happen, we need our coastal environment to remain healthy,” he says. The globe offers many examples of prime shellfish habitat destroyed by human activities. In fact, 85 per cent of all the native oyster reefs in the world have vanished. Unless human behavior and decisions are informed by an understanding of, and respect for, the coastal ecosystem, this fate could threaten Baynes Sound. Kingzett and his colleagues are keeping a close eye on the Raven Mine proposal, which has garnered vociferous opposition locally, in large part fuelled by concerns that it will pollute Baynes Sound. “We don’t at this time have any formal opinion on Raven,” he says. “We are waiting for more research. A big piece of that education comes from the Field Station building itself. Like Dr. Seuss’s The Lorax, who “speaks for the trees,” the building speaks for its coastal habitat. The clam-inspired design of the building mirrors and points to its surroundings. You cross a ramp to get to the entrance, which evokes the feeling of walking along a dock. Once you enter, you face a giant wall of windows opening out to Baynes Sound, with the mountains of the mainland in the background. “The physical design projects your attention to the outside. The purpose of the building is to get people to think about the coastal environment,” says Kingzett. It also models green building approaches and technologies, and was built with the intention of gaining the highest possible rating from the Canada Green Building Council—the Leadership in Energy and Environmental Design (LEED) Platinum Level. Only 13 buildings in Canada have achieved this rating, and Kingzett is confident that the Deep Bay Marine Field Station will join this exclusive club. The building’s “green-ness” ranges from the use of natural materials (wood from pine-beetle-killed trees), to utilities (geothermal heating and cooling; a 97,000 gallon cistern for rainwater catchment, self-dimming lights) to landscaping (drought-tolerant native species) and much more. The Field Station, which had its official opening June 23, was honored in April as one of seven winners of the 2011 Sustainable Architecture and Building Awards. It has also garnered plenty of local interest and is already influencing builders in the area. “There’s a 200-acre development coming in here. The developer heard from the community a request to ‘build it like the university building,’ and so they came to us with questions. They now are planning a green development and have hired a designer who does that sort of thing,” says Kingzett. The building gets an average of 50 walk-in visitors daily, who come because they are curious, he reports. And there are international visitors coming for meetings and conventions. “Everyone who comes will get ideas about green building,” says Kingzett. Outside the building, in the ocean, the shellfish demonstrate the greenest approach to building there is, maintaining a whole ecosystem simply by being alive. They adapt to the changing tides and changing seasons, and thus far have adapted to the humans around them. If they could talk, surely they would express the wish that this big new building, so different from the holiday cottages, bed and breakfasts, and retirement homes that dot the shores around them, will speak to the humans, and teach them how to live in harmony with their coastal habitat. For more information visit www.viu.ca/deepbay.